Spectacular LIVE events in Sports, Concerts, Shows and Musicals are descibed in detail: The production of the 2014 FIFA World Cup Brazil - Robbie Williams Swings Both Ways - The Eurovision Song Contest in Copenhagen - The 18-14 Spektakel Musical are some of the highlights we present. 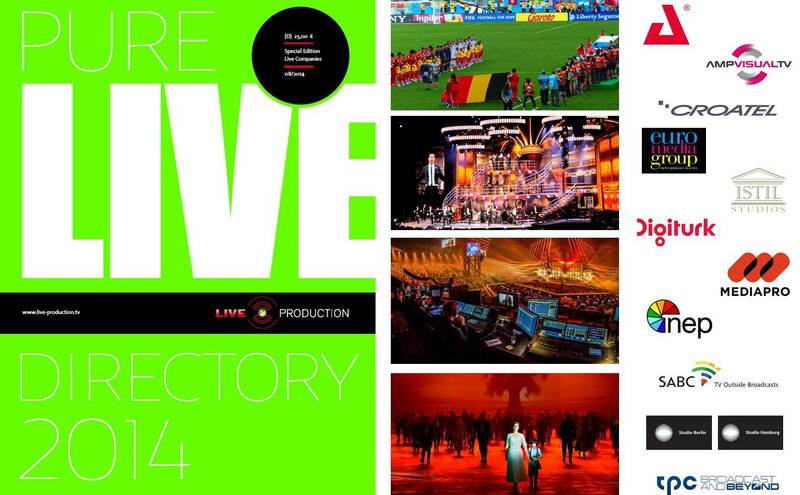 In addition we introduce you to eleven worldwide operating LIVE production companies. Register with your postal address at http://www.live-production.tv/user/register and your personal copy arrives at your desk before you leave for IBC. NEP announced that it has entered into a definitive agreement to acquire all assets from Portland-based remote production facilities company, MIRA Mobile Television (MIRA). This transaction, which is expected to be final on or near August 28, 2014, will integrate MIRA into NEP's US Mobile Units operations. MIRA's nine HD mobile production units will join NEP's fleet of over seventy HD units worldwide, and their renowned engineering and support staff will become part of NEP's team of top experts. MIRA will join NEP's worldwide network, which includes operations across the United States, United Kingdom and Australia offering solutions for remote production, studio production, video display and host broadcasting. Developing innovative solutions for film, TV and internet, TVN Film & TV Production has been existing for 30 years now. One of the company`s special „trademarks“ are several huge, eyecatching OB vans cruising all over Europe in order to broadcast sports, show, as well as concert events for TV and Web. Technical services for film production and TV were the main corporate objective at the time of establishment in 1984 by the Verlagsgesellschaft Madsack. Meanwhile the group incorporates seven companies offering complementary media services forfilm production, TV and web, thus covering the whole production process from concept to publication. KTS is in the outside broadcast industry since 1994 and has developed into the biggest private OB company in the Baltic states. Throughout the years KTS has managed to maintain the same values - reliability, flexibility, technical expertise and competitive prices. KTS is very proud of the fact that there has not been a single case of broadcast failure in the company’s history. The company has grown to be trusted with world feed production of top international events in Poland, across the Baltics and Scandinavia. KTS' 3 OB vans and flexible personnel packages can meet even the most selective of requirements and in turn, guarantee a 100% reliable service. In a relatively short time, Studiotech in Belgium, Hungary and Poland have become recognised as leading players in the field of audiovisual engineering across Europe. Studiotech began in Brussels (serving Belgium and Luxembourg) in 1990, then Budapest, Hungary (1992), Warsaw, Poland (1995) Algiers, Algeria (2000) and Rabat, Morocco (2011). The most recent additions to the Group are Sydney (Australia) and Paris (France). The founders and key members of staff have extensive professional experience which they continue to develop in step with leading-edge technology. Studiotech das delivered DSNG/OBVans to ORTB (Benin) and ORINFOR (Rwanda). The vehicles and corresponding equipment were completely designed, installed and tested by Studiotech in Brussels providing high quality finish combined with great attention to detail. "These are the latest in an ongoing series of infrastructure enhancements and additions which have been completed successfully by ATG's engineers working in partnership with our technical management team," says Pontus Wahlstedt, System Engineer and Chief Designer at Ericsson AB. "They include upgrades of existing channels from standard-definition to high-definition plus additional technical facilities to accommodate new channels. ATG was the logical choice as its systems integration team has an in-depth understanding of the total studio, post-production and playout infrastructure at our Stockholm premises, going back to the building's origin as TV4 Sweden. A key element of each task was to ensure that all scheduled live-to-air and file-based transmission were able to continue without interruption." Based in the United Arab Emirates, Sharjah TV celebrates its 25th anniversary this year and has marked this milestone with a switch to High Definition broadcasting. Over coming months the broadcaster will be enhancing its audiences' viewing experience by offering HD coverage of a wide range of cultural events, all of which tie in with Sharjah's current status as Islamic Cultural Capital of the Arab region for 2014. At the heart of Sharjah TV's HD switch was the Avid upgrade, which was needed to provide additional storage for current production work and to ensure that Sharjah TV was ready for the new format. The two hour highly visual show, produced by global brand experience agency Jack Morton Worldwide (JMW) and directed by David Zolkwer featured a cast of 2,000 plus special guests including Rod Stewart and Susan Boyle, offering a snapshot of the history, character, culture, industry, quirkiness and innate humour of Scotland. It presented the 4500 athletes from 71 participating nations to a live audience of over 40,000 plus around two billion TV viewers. When Routledge – Lead Lighting Programmer for the London Olympics Ceremonies, LD for Gary Barlow, Katherine Jenkins and other high profile artists as well as a prolific TV lighting director and LD - won the pitch from JMW to design the Opening and Closing Ceremonies for the Games, to make maximum impact he actively sought to work with a quality lighting partner who could provide specific elements of the equipment package. The ten days of intense competition saw 140 Commonwealth Games records broken. Although none fell on the table tennis table, Nigeria’s Ojo Onaolapo made his own history when celebrating his country’s bronze medal success by dropping his shorts and lifting his shirt. Since first being included in the Manchester 2002 Games, table tennis has invited fierce competition. Sharing the Scotstoun Arena with the competition’s squash events, the table tennis matches took place in two 2,500 seat ‘show courts’, and a further eight match courts. The broadcast of these matches was in the hands of Arena Television, with Audio Guarantee Engineer David Harnett taking charge of the company’s OB14 mobile – and its Lawo digital mixing and routing systems. Vasco was back this summer, 2014, with seven sell-out concerts at stadiums. The tour consisted of three dates at the Stadio Olimpico in Rome and four at the Stadio Giuseppe Meazza in Milan. Vasco became the first artist ever to do three consecutive nights at the Stadio Olimpico, and set a new record total number of twenty one performances at the Stadio Giuseppe Meazza. The show itself was truly fit for breaking records: an exceptional, extremely impressive production. Clay Paky's lights were a must for the stage. The new A.Leda B-EYE K20s stood out in particular among the "special lights" in the lighting design. There were thirty eight on stage and fifteen on the large external structure. Founded by Colin Benders (aka Kyteman), the Kyteman Orchestra plays a mixture of hip-hop, opera and jazz laced with melodies and raw beats. Its first album, The Hermit Sessions, was released in 2009 and was a great success in the Netherlands where it reached the top five of the Dutch Album Charts and sold over 75,000 copies. Sjoerd Terpstra, who has been working with Kyteman for the last five years, says he chose DPA microphones for this project because he knew they were capable of delivering studio quality from the live stage. The microphones were supplied by Amptec, DPA's distributor in the Netherlands. Hedon, a well-known live music venue in Zwolle, the Netherlands, has recently had a full Robe moving light rig installed into its brand new building which features an 850 capacity main hall plus an equality active small room that can accommodate 200 people. The venue has been a local landmark for the last 15 years, showcasing an eclectic and vibrant mix of international and home-grown talent – anything from comedy to music of all types bands – with a hectic schedule of 25 – 30 shows every month. This sometimes peaks at around 50! At IBC2014 EVS will build on its 20 years as a pioneer in live TV production and showcase how it will help customers meet the challenges and tremendous opportunities of a new media landscape over the next 20 years. EVS will underscore four key technology and business priorities supported by new and improved solutions across Sports, Entertainment, News and Media markets. The live video technology leader presents four technology priorities: mastering media workflow; working more productively; reaching more audiences; transitioning to future workflows. Broadcast Pix™ announced PixPlay, a new software option that will allow any Broadcast Pix integrated production switcher to provide slow motion control to a Blackmagic Design HyperDeck or AJA Video Systems Ki Pro disk recorder. Originally developed as a cost effective solution so game officials could review footage for high school and college sports, PixPlay can also be used during production for almost any sports application, including football, basketball, baseball, soccer and even extreme sports like auto racing. Regularly priced at $495, PixPlay will be offered free to customers purchasing a new Flint™, Granite™ or Mica™ integrated production switcher until Sept. 30. Miller Fluid Heads reels with enthusiasm as it prepares for the European leg of its 60th anniversary celebration at IBC 2014 (Hall 11, Stand 11.D30). Continuing its professional progression in supplying the film and television industries with revolutionary high-end tripods and fluid heads, the Australia-based camera support solutions company will introduce its new Cineline 70 Fluid Head to the European market at the show. “Since Miller’s launch 60 years prior, the company has delivered more than 100,000 tripods and fluid heads, acquired several patents and won numerous awards for its exceptional quality and design,” says Mike Lippmann, European manager, Miller Fluid Heads (Europe) Ltd.
On Monday 18 August 2014 the Blackmagig Design Ultra HD OBVan is on show at BPM in Hamburg. Visitors will experience typical scenarios from the broadcast,live event and post-production areas. All these different workflows are integrated in one mobile van. The highlight is the German premiere of the new URSA 4K camera. Visitors can sign up at http://bit.ly/blamatour . The Blackmagic Design OBVan is available at 10:00h in front of the BPM Showroom at Obenhauptstraße 15, 22335 Hamburg. 2014I-MOVIX is a worldwide leader in extreme slow motion for sports broadcast (from 75 to over 5,000 FPS). The company’s products are the first true ultra-slow motion systems, fully integrated for broadcast use, offering the unprecedented combination of very high frame rates and instant replay, or continuous streaming. The technology has applications in live sports and other live TV productions, as well as in commercials, documentaries, feature films, and scientific R&D. “IBC 2014 is the first European showing for the new X10 UHD 4K system, which has had an amazing market response since its launch earlier this year. With its extraordinary specification X10 UHD easily outstrips the competition and demonstrates I-MOVIX leadership yet again.”…Laurent Renard, CEO at I-MOVIX. 4K Studios, a NanoTech subsidiary, will use its film proprietary post-production processing technology to deliver films originally captured on 70MM film to consumers in streaming digital 4K Ultra HD over internet connections that are available today. The 70MM format has roughly 18 thousand lines of resolution, making it ideal for delivering in the 4K Ultra HD digital format. Many of these films have been scanned in 8K resolution, and then down-converted to a pristine 4K Ultra HD format. With these new Giant Screen titles, UltraFlix subscribers will be able to choose from more than 350 hours of sci-fi, action/thriller, comedy, drama and family movies as well as knock-your-socks-off extreme sports videos, concerts, TV shows, special events and moving murals in addition to 100 hours of free content.